Here’s a recent address for the Adriatic South Mission. We try to keep this information up to date, but it’s a good idea to check the address with several sources, including your mission packet or the mission office. Here’s a list of LDS missionary blogs for the Adriatic South Mission. This blog list includes the missionary’s name, URL and when their blog was updated. 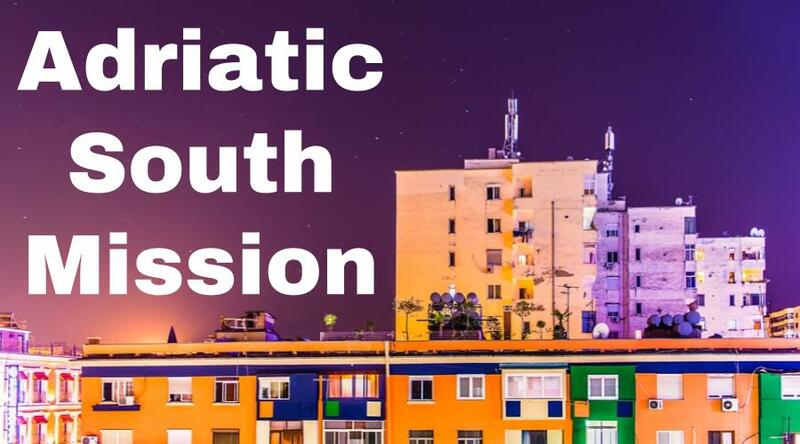 Here are Adriatic South Mission Groups- for LDS missionary moms, returned missionaries, mission presidents and other alumni of the Adriatic South Mission. Here are T-shirts for the Adriatic South Mission! Shirt designs include Adriatic South Mission logo/emblem shirts and Called to Serve shirts. The shirts make great gifts for pre-missionaries, returned missionaries and missionaries currently serving. LDS Mission shirts come in all sizes: Small, Medium, Large, Extra Large, up to 4XL. The mission designs are printed on white shirts and are shipped to you. *Simply click on a shirt design to view the details and submit an order. The designs on mission t-shirts may also be printed on other LDS mission gifts, including: Adriatic South missionary aprons, Christmas stockings, ties, pillow cases, teddy bears and Christmas ornaments. Here’s a list of current and past Mission Presidents of the Adriatic South LDS Mission. Here are survey responses from Adriatic South RMs, to give you a snapshot into what it’s like to live in the mission. What are some interesting facts about the Adriatic South Mission? Any advice/testimony for pre-missionaries going to Adriatic South? It was a long trip from Utah to Albania. It was 24 hours of travel. It was a long flight. I think I slept a total of 30 minutes. When I got to the mission office, we went street contacting right away. That was a good experience. It was very basic and you had a senior companion next to you. I was so exhausted that night when we had a devotional. I crashed that night. The next day we got our trainers and went tracting. We got kicked out of a building actually. They said we couldn’t tract there. That first week was so exhausting. Hearing Albanian 24/7 was so tiring. My first sunday having Albanian for three hours straight was so difficult. Luckily the members were so welcoming. I had to take everything in stride. I testified of what I knew to be true and relied on my mission companion for the rest. When I first got my call it was Kosovo, Macedonia, Montenegro, and Albania. Montenegro is part of the North mission now. Macedonia only has Macedonian speaking missionaries called there. The people there are really fast speakers. Albanians are fast to point out mistakes. Vlore is on the beach. I was there in the winter, so it wasn’t as popular as it would be during the center. It’s like a small city, but it’s actually large if that makes sense. There is only one main street that goes through the town. The people there are very passionate and very friendly. It will always have a special place in my heart as my first area. I made a lot of good memories with the members there. I went to the capital, Tirana, for several months. A lot of my good and bad experiences were in Tirana. It’s a big city with a lot of stuff going on. You get people from all over Albania. I had a lot of awesome experiences there with the members. We got really close to the members. My first week, there was a sister talking in Sunday School and she sounded like a member, but she wasn’t. Now, dads in Albanian culture are very much in control and he wouldn’t let his daughter get baptized even though she came to church every week for five months or so. One week we all fasted for her and she came up to us that Sunday and told us that her dad would let her be baptized. That was a really cool experience. I ended my mission in Gjakova in Kosovo. It was a really different experience after being in Tirana. My first week there was when the group there became a branch. I had the opportunity to serve in the branch presidency. It was a very different experience. It was hard. Kosovo has been though a lot of hard times with war and communism. Albania is 70% Muslim and Gjakova is like 90% Muslim. The Church is definitely a lot newer there. I was living in Macedonia when I received my mission call and it was a little disappointing getting called just a country over from me, but after prayer I realized that it was where I was meant to go. I was just happy to be there in Albania, because it took a long time to get there. I had to wake up early in the morning and fly through a bunch of different airports. It was such a long travel so I was so happy when we finally touched down. Driving to the mission home was pretty crazy, but it wasn’t as bad for me as for other missionaries that had never traveled outside of the United States. Cars switch lanes without blinkers and lay on their horns forever. I was pretty relaxed though because I had live in other countries. When I arrived, I want to say there were 40 missionaries. By the time I left in 2014 we had 70 to 80. It was cool to see the growth of missionaries that came along with the age change. In Albania, there are mostly Muslims. There are also Catholics. In one of my areas, there was basically an imaginary line drawn in the city between the Muslim North and the Catholic South. There are Orthodox Christians as well, but the defining line had a mosque on one side and a massive Catholic church on the other. I think it was one of the biggest churches in the Balkan area. When I first arrived, the mission president told us that he wanted to have a stake by the time he left. Looking at the numbers of church attendance and baptisms made it seem like a really hard task. We knew that President Ford was inspired to set that goal and the Lord knew that the missionaries coming in had the skills and determination to do that. Two months after I left, the first stake in the Balkans was established. That was really cool to see the church grow from groups or branches into wards and to have a stake taken over by Albanians themselves. To see the Albanians take it over was so awesome. Most of the missionaries are all in Albania. That’s where the strength of the church is in that mission. Of course there are other faithful members in the other countries in the mission. I think we only had 12 missionaries in Kosovo. I think more have entered since then. I think there were only four missionaries in Macedonia. Albania was pretty much the center. The biggest misconception of Mormon missionaries there is that we’re Jehovah’s Witnesses. They dress up in button down shirts too and sometimes look like us. People would all call us Jehovah’s Witnesses, so we had to talk to them and set them straight and show them our badges and tell them we have no affiliation with Jehovah’s Witnesses. That was something I wasn’t ready for. I don’t think Albanian people like them that much, and they have told me that there were kids told that if they killed themselves then they would receive some reward, and that set a bad light for the Jehovah’s Witnesses and even a little bit for us when we were confused for them. In my last area, no one confused us for Jehovah’s Witnesses, and that was really great. They referred to us as the Mormon boys or the white Christian boys. Tracting was way more effective than street contacting. It may sound like I’m trying to corner them, but when you street contact they have ways of getting away from you, but when you tract , they have to talk to you. The members are awesome. If you get the members involved in lessons, especially the youth, it will be great. The youth are awesome. I remember youth that were really strong in the gospel and really wanted to serve missions. The people are very stubborn. They put their foot down and are very firm in their decisions. It can be negative, but I see it as positive. There is a debate right now as to whether Alexander the Great was Macedonian or Greek, and they’ve built giant Alexander statues in the middle of Macedonian cities. There is a big population of gypsies and it’s difficult and a little sad. I had an opportunity to serve there and teach English. They are looked down upon in Macedonia. I was able to a wedding and it’s a week long. They get as drunk as they can every night, dance all night, and have loud music all night. It’s a lot different than American weddings. There is a big Albanian population in Macedonia. They would say their cultures are very different, but as an outsider I didn’t see too big of a difference. Get clothes that are light- at least for me- I had to wear like two or three shirts- I just had to rotate them during the summer because they were the lightest ones I got. Get mesh garments- my companions had them- they were not as hot as the carinessa ones I had. If you’re an Elder there were places there to get your clothes dry cleaned. Try to get shirts and skirts that don’t need to be ironed if you’re a sister, because they have washers, but not dryers- you hang your clothes to dry. I left most of my clothes on the way home because I couldn’t fit them in my luggage. Don’t bring anything you’re not going to use. I’d bring Icy Hot, because it’s a walking mission unless you’re a an assistant, zone leader or sister training leader. If you’re not used to walking, you’ll get sore, or on preparation days after hiking you’ll get really sore- I wish I had Icy Hot over there to help with muscle cramps in my legs and stuff. Tirana is a super busy city. It was a really fun change for me because there is so much energy in the heart of the capital city. There are a lot of old apartments from communist times. Sometimes they are really colorful now because they weren’t allowed to do that during Communist rule. The graffiti over there is super funny because they try to do it in English. They have this sausage that is really good. I thought Kosovo wouldn’t be as developed as Tirana, but I got there and it looked very developed and very European. You have to be careful when meeting Muslims, you couldn’t push them. You kind of just had to let it go. We had to do a lot of contacting on the street. If you are able to get a conversation going, it is super interesting. I loved asking them what they loved and what was important to them. There was some political unrest and we couldn’t proselyte for a week. At one point we had to take off our badges. It was interesting having that because it made you realize just how much you wanted to go out and help people. The Albania heat is super humid, so I hated the summers there. I was Kosovo during the winter and it snowed all of the time. It was the coldest I’ve ever been, but I loved it and it was so pretty when it snowed. We were close to an army base an hour away. We were able to go up there with a couple members and I loved meeting the soldiers there from America and from a lot of other places. It was amazing seeing how the gospel can affect all aspects of your life. The Albanian people are very humble and willing to help. They take a while to get used to, because the culture is so different. In America we don’t like to talk about our problems, but they do. It’s not a problem usually. If they have medication, then they will show you that medication to show that they are sick. They are also very blunt people. If you have zits on your face or if you have a different body type, they let you know that every day. That was hard for me to get used to. Sometimes it’s very nice, but sometimes you just have to smile. They are a very loving and carinig people. There is no one on the street during rainstorms because of superstition. They don’t go out in the rain because they don’t want to get sick. During the winter, you have to wear socks and slippers in the house. They will give them to you if you don’t have them on. In the summer if you are in a room with an air conditioner and you sneeze, they will turn the air conditioner off because they think it is making you sick. There were times when we were out in the rain and people would invite us in and give us towels and blankets to drive off and get warm. Even the poorest would invite us over for dinner and they would give us incredible meals. I know that the Lord blessed them for that. The church- I believe they have a stake going on two years this March, and they have six wards I think, and then four branches in Albania alone- that’s not counting Kosovo. I’m not really sure on Kosovo. I think when people think of Eastern Europe, they think the people won’t listen to you, but what we found in Albania is the Albanian people are really humble. We always were able to find people willing to listen, and a lot of missionaries had a lot of success. The religious background of people is Muslim- a small percentage of that is practicing Muslim. They were under Turkish rule for like 500 years, the Ottoman Empire. They were under a lot of Muslim control, and then they got free and had their dictator come in (Enver Hoxha) and declare their national religion Atheism, and communism came in. A lot of the older generation, you’d ask “are you a believer, what do you believe?” Some would say I’m Muslim, Orthodox, Catholic, Atheist, Communist- the older generation still has a lot of that mentality. I think it was 1992 that Albania opened back up to churches. With a bunch of churches coming back in- if you ask any Albanian they’ll tell you the history of Albania from Turkish rule to how their hero Skanderbeg took them down, to emperor Hoxha- just ask an Albanian and they’ll be glad to tell you the history. Some people are kind of close minded, but overall they’re really nice, respectful people. If I could go back, I would try to focus more on the people in front of me. I tried to see where they were coming from, but a lot of times I’d think why are they not accepting. If I could go back I’d try to see things more through their eyes. As far as temples go, we’re excited, because the Rome, Italy temple will be open soon. Right now they go to the Frankfurt, Germany temple and that’s a 600 Euro trip, and in a poor country like Albania, that’s hard. But soon they’ll be able to take a simple boat ride across the sea. A Stake President I talked to is already planning trips for youth to do baptisms in the temple. I think that will help build and grow the youth- to have their eyes set on the temple, and be able to go at least once. I think that will help the overall church growth in that area. The church is small, it’s only been there for 24 years now, but from what I’m hearing- emails from missionaries over there- they’re starting to open up new areas and it’s growing. I served from 2012-2014 (basically) in the Adriatic South Mission. I served in Vlorë, Elbasan, Tirana, Fier, Lushnjë. I remember waiting in the airport in Austria sitting next to a bunch of Albanians and I just had no idea what they were saying. When we landing I was a little weak in the knees. That was my first experience with the culture because they didn’t have a very great line like in the states. Instead they just all try to cram in and there was a lady trying to cut in front of everyone. The Adriatic South Mission started out as the Tirana, Albania Mission. It opened I believe in 1990- around there and that was around the time when the communist regime fell. Albania had been under a Communist dictatorship for 40-50 years and when that fell they decided to put in a type of democracy, and so Albania was under a huge change, and still is changing constantly. They’re learning how to interact with everyone around them, because they’d been walled off. They started importing and tried to export goods. There was a huge social shift from- us, our country, no one else- to we need to be a part of this world. The mission opened shortly thereafter, it was blessed and dedicated, opened to missionary work. We flooded in with people from other faiths, and the Albanians decided to revert back to the religion they were before Communism, which was Islam and so 70% of Albanians are Muslim, the rest went back to their Greek Orthodox or Roman Catholic roots, and a small piece belong to random religions. Islam, Greek Orthodox and Catholic are the big religions over there- mostly Islam. 24 years later- a little less- we opened up Kosovo which used to be part of Yugoslavia and that whole area- a war torn area. They broke off from Serbia and became Kosovo- the people there are war hardened because of what they’ve had to go through- it’s made them receptive to the Gospel, because it’s a message of peace. So we opened up Kosovo with great success. We recently went into Macedonia to include that in the mission, and though it’s been a difficult transition because these people have never been exposed to the Gospel before- the government is very wary of us being there- there’s a branch there, the work is growing, and it’s hastening just as the Lord predicted. And so those three countries make up the Adriatic South Mission- it all functions under one mission home. The success in that area is shooting up comparative to where it was 10 years ago, so a little bit of history about the mission. Albanian people have been through a lot. They have been conquered so many times, but they are bouncing back. Because of everything they have been through, they have these tough walls they put up. When you get through that they will love you and feed you. They will give you the decorations off their walls if you like them. Once you get past that outer shell it’s great. The man is the man of the house. What he says goes. He goes out and works to provide. The woman stays home and cooks, cleans, and takes care of the kids. The sons are like princes, and the daughters learn at an early age that they need to marry someone successful. There are feminists there, but they are definitely the minority in that culture. When you go to people’s houses, you always take your shoes off. They then give you slippers to wear so your feet aren’t cold so you don’t get sick. Family is key to them, especially loyalty to the family. You protect your own, watch out for your neighbors, and are just good to other people. They have olive skin, are short, and have dark hair. Blonde and red headed Albanians are so rare. If you have red hair, everyone will freak out and touch your hair. I was called to the Albania Tirana Mission- it was just Albania and six weeks into my MTC stay, our call changed to the Adriatic South Mission- it expanded to Albania, Kosovo, Macedonia and Montenegro- they spread out missionaries- six months into my mission we let Montenegro go, because no one spoke that language, so we gave that to the mission that spoke their language. So those are the three countries we covered. When I started we had about 35 missionaries and when I ended there were about 60. The units of the church- we were in a district our entire mission- our mission president had a goal to have the first stake in the Balkans, and I remember thinking in the interview that first day- I thought that’s cool- then I looked at the numbers and we were pretty far off. Tirana was the capital- we had four branches in that one city. One branch had an average of about 80 members, whereas the smallest branch had 15 members show up one Sunday. So 15-80 attending members. I heard cities up north where the missionaries outnumbered the members. The most they had were 30 and they were stoked. So it ranges from 1-100. So all my mission was trying to prepare for the stake. My mission president would remind us regularly about the goal. The stake’s coming up, and we’d get special assignments- we needed the right amount of Priesthood holders, etc. I saw it growing in the mission. It was an amazing experience seeing the growth and the light we were bringing and then three months after I got home, the first stake was made- I think they combined a couple branches into wards- two wards and then we had a stake. So my mission president went from being the district president and mission president to just a mission president and they called a stake president. And we saw patriarchs called and the growth of the church and establishment of it- it was a cool experience to see. I was proud that I was there to help- it was amazing. Albania was pretty secluded, not many people in Europe go to Albania, which is sad because Albania is a beautiful country. If I met anyone in Albania who wasn’t Albanian, they were Greek. So I served 2012-2014. I started in Tirana, then to Fier, to Elbasan, back to Tirana and then down to Vlorë. I served in the middle to southern half of the country. Missionaries were first put into Albania in 1992 or 1994. All missionaries were pulled out for 3-5 years during a civil war in Kosovo, from 1996-7 until 1999-2000. They pulled them out, and put them back in once they could. It’s only been a mission and had LDS influence since 1992 until now, and missionaries were out for about five of those years. I wish I would have been more accuainted with Preach My Gospel. I should have read and studied from it more before the mission. It helped make my testimony so much deeper and it made my understanding deeper. I had more power teaching. Before my mission, I had a lot going on and other opportunities were given to me that I could have chosen. I was praying about it one day and I knew what I needed to do. My papers were in the next week. Making a decision and sticking with it is what you’ve got to do. The first day was pretty typical. It was like a 19 hour travel time from Utah to Albania. I was hoping to get there at night so I could go to bed, but we got there in the afternoon. I remember driving down the highway and thinking I was gonna die. The way Albanians drive is a lot different. I thought we would get hit. I think I saw less wrecks in Albania than I did here. We got to the mission home and while some people were being interviewed, the others would go out with the APs to go street contact. I hoped that the AP would do it, but they made us contact instead. It was fun trying to speak the language. I remember getting a number from one person and I was so happy. The first day was long but it was fun. Once we got outside working I wasn’t as tired anymore. Tirana is where I first started. It’s kind of like New York there for Albania. It’s the most industrial. There are factories, skyscrapers, nice buildings, and nice apartments. If you needed a store, there were 50 right under you. You could get whatever you wanted. The first exchange I had I went to a smaller town and I felt weird because when I looked straight I could see blue sky. In Tirana you look forward and you see tall building. If a power line goes out in Tirana, they just put a new one over it instead of taking it out. I was in the nicer, more central part of Tirana and it is more upscale and everything was really nice. I was there for six months. My next area was an hour and a half down. That was interesting because it was like mini Tirana. The center of the city had one tall building, a big bank, and some nice stores. You just have to walk five minutes to get to the outskirts. They have these little vans and buses that go city to city. That’s mostly in Tirana though. I think there are trains, but they are really slow. Most people take the vans and they cram 20 people in there, but that is perfectly normal for everyone. A lot of people didn’t really own cars. The cost of living is way cheaper there. We would get like $230 per month per missionary and we didn’t have to use that for rent, so we would eat out every day because that was cheaper. There was a chain supermarket in some of the big cities. That was probably the nicest place I had ever shopped at in Albania. Most stores are small rented out places just stuffed full of food, soap, string, paper, drinks, anything you wanted. Across the street would be basically the same store owned by someone else. People owned their own stores and mostly had the same stuff. My next area I got to train. That was fun because I didn’t have anyone else to lean on. I had to learn the city a lot more myself. There weren’t big stores in this city though. It was one story houses as far as you could see. I had a lot of fun there training and learning the city. You would tract door to door down the street instead of knocking an apartment complex. In the middle of their city is a castle wall from the 1300’s or something. The interior of the castle was basically gutted and there were normal houses right there on the other side of the wall. For fun, people would go to the main square and walk up and down the streets with their friends. You could see everyone in the city there. I loved that they were so blunt. If they saw a large person they would say hey he’s fat. I’m not the most subtle person and that would get me in trouble here. They are some of the toughest people I have ever met, especially the older generation. They could be really old and they would walk all the way across town to get groceries and walk back. They do what it takes to survive. They love their family too. The families would basically all live in one house. Strangers on the street would tell us about their families and kids. Generations live in houses and pass it on from parent to child when they pass away. The importance of the family was very evident in their lives. Family is family forever. They don’t have carpet over there. It’s all concrete or tile. They have rugs sometimes. When you come in you have to take your shoes off. Then they would have cabinets full of slippers of every size. I was shocked. They had so many. If your feet got cold you would get sick is what they thought. Their houses were always immaculate. I never saw a dirty house. You always took your shoes off. They were taken over by the Muslim Ottoman empire and forced Christians to leave the country or convert to Islam, so a lot of people did convert. Communism then came through Albania and they would tear down cultural buildings and mosques and tried to suppress that. They didn’t have religion for a while because of that, but when that Communist period ended, Islam swept through first. I would talk to people about Jesus and they would say he is just a prophet. They see him as just an inspired man instead of the Savior. It’s difficult but fun to implant that in their minds and see that growth. There is plenty of crime. The Albanian mafia exists. Trafficking exists. When you’re a foreigner, you’re a target. I was never in any real danger, I always felt safe, but a sister missionary I knew got her purse stolen with her passport and credit cards. Keep those valuable things safe. Wallets and things commonly get stolen out of back pockets. I had a front wallet that was just a clip. It’s a lot harder to steal out of the front pocket. In the insanely crowded bus you have to protect your bag in front of you. Some Elder’s in Kosovo had their apartment broken into. Some sisters got beaten up in Kosovo as well.